Nov. 8, 2017 2:42 p.m.
Just two days after an Abbotsford Police Department officer was killed in the line of duty, a memorial to two fallen Chilliwack RCMP officers was unveiled in front of the Airport Road detachment. It was Christmas Day in 1997 when Const. Gerald Fortis of the Sumas RCMP Highway Patrol succumbed to injuries received during an icy crash on Highway 1. Five years later on Dec. 22, 2002, Const. Vernon Genaille of the Agassiz RCMP detachment suffered a fatal heart attack during an arrest of scrap metal thieves in Popkum. Fortis and Genaille are now memorialized in both a bronze commemorative display in front of the Chilliwack RCMP detachment, but also on a wall of honour inside the building. 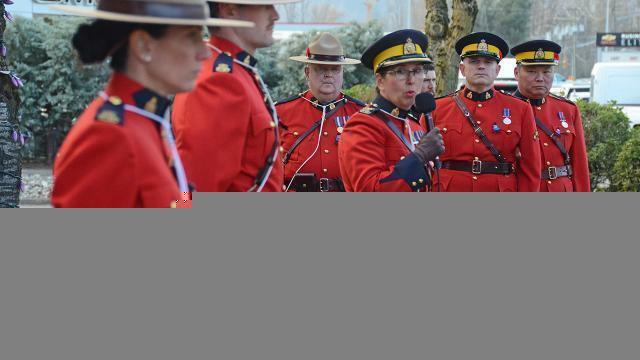 “This is a tribute that will give our citizens a place to pay their respects,” Chilliwack RCMP Supt. Deanne Burleigh said at the ceremony attended by dozens of Mounties, along with dignitaries, as well as family members of the deceased officers. Also speaking at the ceremony were Harrison Hot Springs Mayor Leo Facio, District of Kent Mayor John Van Laerhoven, and Chilliwack Coun. Jason Lum on behalf of the mayor and city council. A number of local businesses helped fund the monument, but $2,500 in funding was also received from provincial civil forfeiture proceeds. “Memorials that show respect for professionals who put public safety ahead of their own, especially those who’ve paid the ultimate price for their selflessness, serve as important reminders of how police officers are fundamental to the safety and quality of life we enjoy in B.C.,” said Minister of Public Safety and Solicitor General Mike Farnworth in a press release. “We remember our fallen officers every day,” Burleigh said Wednesday.